Notes: Associated with Book ID 3806. 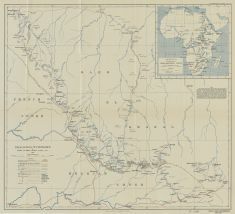 In the upper right corner, inside the neat line, there is an inset with the overview of the African Continent with the main Trans-Continent Routes at scale 1: 50 Million. Published in "The Geographical Journal, Sep. 1917" by the Royal Geographical Society.